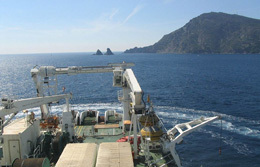 Orange Marine is renowned for its teams’ expertise, and has the advantage of a human-sized company. Our customers thus always find an attentive ear to their expectations at all levels of the company. To ensure the highest quality of service, Orange Marine delivers a specific quality plan for each contract, which includes the explicit and implicit requirements of customers, and describes the means used to achieve them. Engaged in a process of continuous improvement, Orange Marine strives to offer the best quality of service, meeting or possibly exceeding customer requirements. Orange Marine is very attentive to the working conditions of its employees. Our aim: to protect every employee, regardless of his/her position and prevent health risks. active prevention policy, through the drafting of intervention plans and the organization of regular situational trainings. 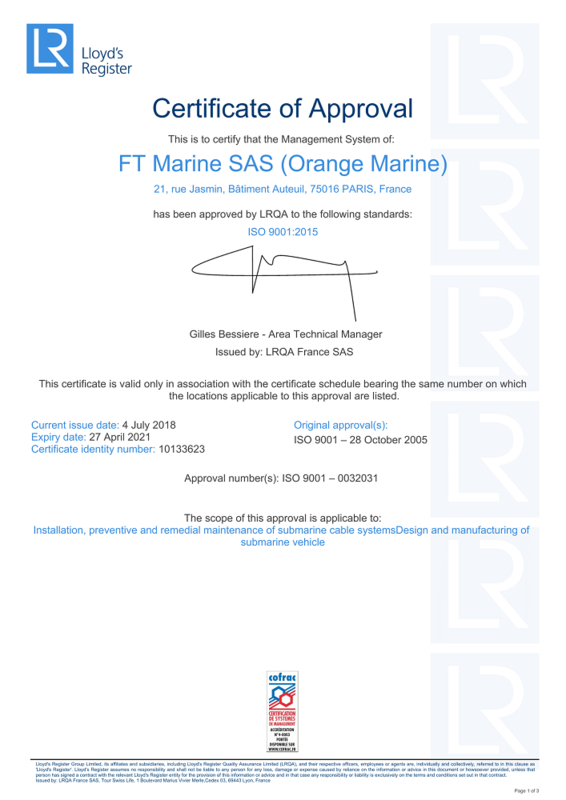 All Orange Marine sites and ships are certified ISM – International Safety Management Code – International Management Code for safety management, reference to establish in each Armament a system of prevention of injury to persons, properties and environment. 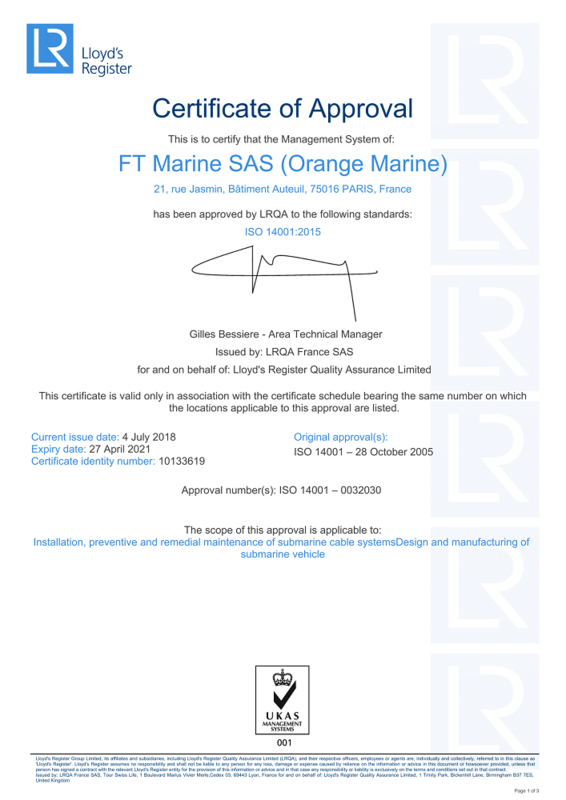 Orange Marine is certified ISO 14001. It means our company is voluntarily committed to assess and manage the impacts of its activities on the environment, in a process of continuous improvement and in compliance with regulations. control refuse management system on marine bases and ships, to reduce the quantities produced and limit releases on one hand, and to supervise the selection of approved suppliers to ensure adequate treatment of waste on the other hand. prevent any insidious or malicious action. implement trainings to security alerts. To enter Orange Marine sites, you will have to show an identity card or a professional badge showing the official identity. 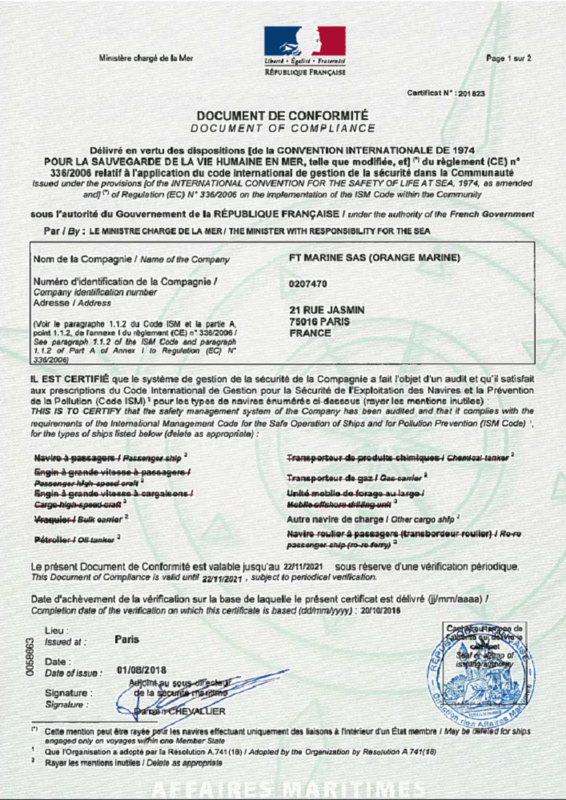 Orange Marine is certified ISO 9001 and ISO 14001, to guaranty a standard of service quality. Each employee is committed to offer the best service every day.